RVers will find some fabulous golf available in the western part of Nebraska, though a little driving between courses is required. You won’t find kinder people than those in Nebraska, who always offer a helping hand and a warm smile. Cornhusker state residents love to showcase their Midwest plains lifestyle and hospitality, which is readily evident at every stop. Beginning in McCook, only 14 miles north of the Kansas border, visitors will discover this quaint town offers plenty to explore. Highlights include one of architect Frank Lloyd Wright’s few homes west of the Mississippi River, the Museum of the High Plains and Carnegie Library, along with the popular prairie chicken dance tours. Golfers will appreciate Heritage Hills Golf Course, which opened in 1981 as one of Nebraska’s first links-style courses. This well-maintained course gives new meaning to the term “up and down”. Measuring 7,131 yards from the tips, this par 72 course features frequent natural hills and plenty of picturesque scenery throughout the 18-hole track. Heritage Hills underwent a major renovation in 2013, which resulted in lush rolling fairways and fast greens that provide an unforgettable experience. The McCook area offers fine campgrounds, including Red Willow State Recreation Area. Featuring more than 200 sites, Red Willow offers 48 designated specifically for RVs and include 30/50 amp electrical, dump station, shower facilities, and fabulous views of the lake. Heading north on U.S. Route 83, called the Veterans of Foreign Wars Memorial Highway in Nebraska, is the town of Valentine, which is a few miles south of the South Dakota border. The iconic U.S. 83 travels from Canada to Mexico, and stretches 1,885 miles, with 222 of those miles in Nebraska. 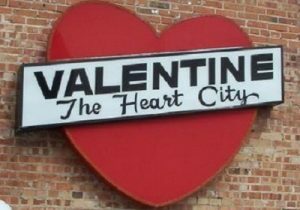 Valentine found its beginnings as a rowdy railroad town back in 1883 and was actually named after Civil War veteran E.K. Valentine. Golfing is exceptional in Valentine and features two 18-hole tracks and a par-3 10-hole course within The Prairie Club complex. The Dunes Course, designed by Tom Lehman and Chris Brands, was ranked by Golf Digest as the 35th greatest public course in America. Measuring 7,562 yards from the championship tees, The Dunes Course consists of dramatic changes in elevation, vast bunkers, and panoramic views. The Pines Course stretches to 7,403 yards and was designed by Graham Marsh. It ranked number 75 in Golf Digest Magazine’s greatest public courses line up. Canyons and the remains of an ancient ponderosa forest make the Pines course an epic golf experience. 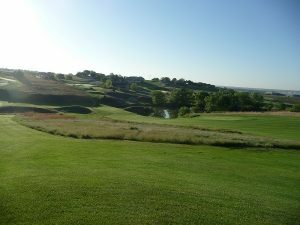 Located north of Merritt Reservoir, the Prairie Club also offers a 10-hole par three Horse Course. Valentine also added another 10-hole course in mid-2017. Frederick Peak Golf Club is a par 39 that stretches to 3,591 yards. Also designed by Tom Lehman and Chris Brands, Frederick Peak Golf Club offers majestic views of the Sandhills as well as Frederick Peak, a local landmark for which it is named. 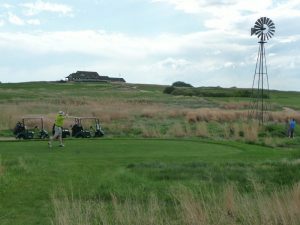 Another course worth visiting in western Nebraska is Wild Horse Golf Club in Gothenburg. The 7,030-yard Wild Horse opened in 1999, and ranked number 68 on Golfweek’s list of best modern courses in the U.S. Featuring wide open fairways in a bucolic setting, Wild Horse Golf Club was designed by Dan Proctor and Dave Axland. Stiff winds are a standard at Wild Horse. 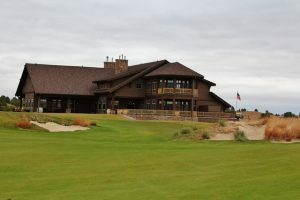 The links-style Bayside Golf Club in Brule overlooks the 22-mile long reservoir Lake McConaughy, or Big Mac as it is called. Also designed by Dan Proctor and Dave Axland, Bayside is a modest 6,545 yards from the tips, but the hilly terrain more than makes up for the lack of distance. The finishing hole offers a great vantage point of the clubhouse and lake. You won’t find traffic in this part of Nebraska, just the occasional sound of a passing train, coupled with endless fields. After a round of golf, make sure and try the fresh fish or other menu items served at the Bayside Grill, which overlooks the 18 green. When visiting Bayside Golf Club in Brule, a good place to park your rig is the Eagle Canyon Hideaway two miles away. Western Nebraska offers plenty of adventures. More information about the Cornhusker state can be found at VisitNebraska.com. You missed Cross Creek Golf Links in Cambridge, NE!